If you are like me, and feel like hyperventilating when you are persuaded to visit a shopping mall, don't panic at the idea of going to the mother of all malls, MOA. The following is a list of things you can do besides shopping. 1. Check the rotunda for different events. We were lucky enough to visit the day of Contest of Kings, an Elvis impersonator contest. I managed to get a bit of it on video with the Sony camera I keep in my bag. It was quite entertaining. The little guy was 12 years old. Check the mall's website to see what will be happening during your visit. 2. 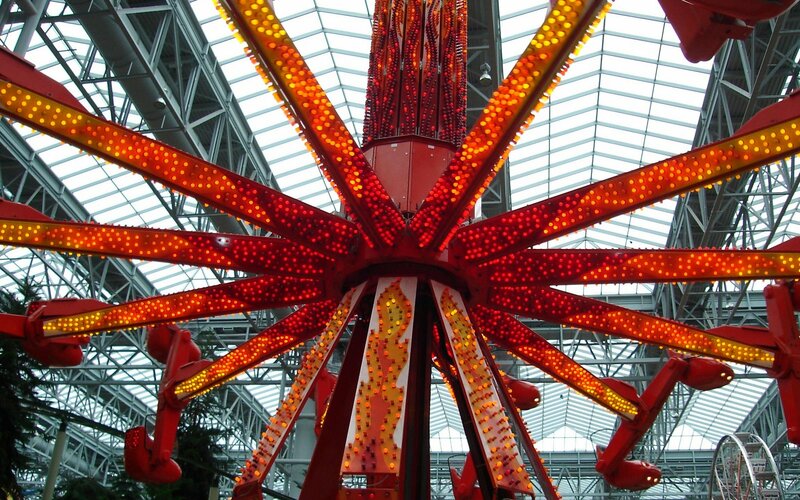 If you like amusement park rides, visit The Park at MOA in the center of the mall. I like the swings. ***Effective March 2008, the park is now called Nickelodeon Universe. 3. Do you like marine animals? Visit Underwater Adventures Aquarium. 4. Get in some exercise and walk the mall. The walking distance for each level is .57 miles. 5. While you are walking, stop at Rybicki cheese on the 3rd floor of the West Market. They have free samples of their delicious Wisconsin cheese. 6. When you are done walking, sit on any of the benches lining the mall. Pull out the book or magazine that you brought for the occasion, or just people watch. 7. If you like books, but forgot to bring one, you can always hole up in the Barnes and Noble book store until your group is done shopping. I don't have any restaurant recommendations, because we rarely eat there. If you like fresh pretzels, though, try Auntie Anne's on the third floor in the North Garden, they are my favorite. If you can handle the crowds and noise level, it's not too bad. If you can go on a weekday, it's even better.